Planning an adventure in Phoenix, Arizona? Before you hit the road, you’ll need to plan how you’ll travel to this beautiful Southwestern city. However, planning a trip, especially with a large number of passengers, can often be challenging. That’s where Phoenix Charter Bus Company comes in. We make the bus reservation process simple and easy, taking transportation logistics off your plate so that you can focus on the fun parts of your trip. Don’t spend hours researching the best parking areas and pickup and drop-off locations or figuring out Phoenix’s most efficient travel routes. Leave that to our experienced reservation specialists, who will ensure that your Phoenix trip progresses as smoothly and as efficiently as possible. 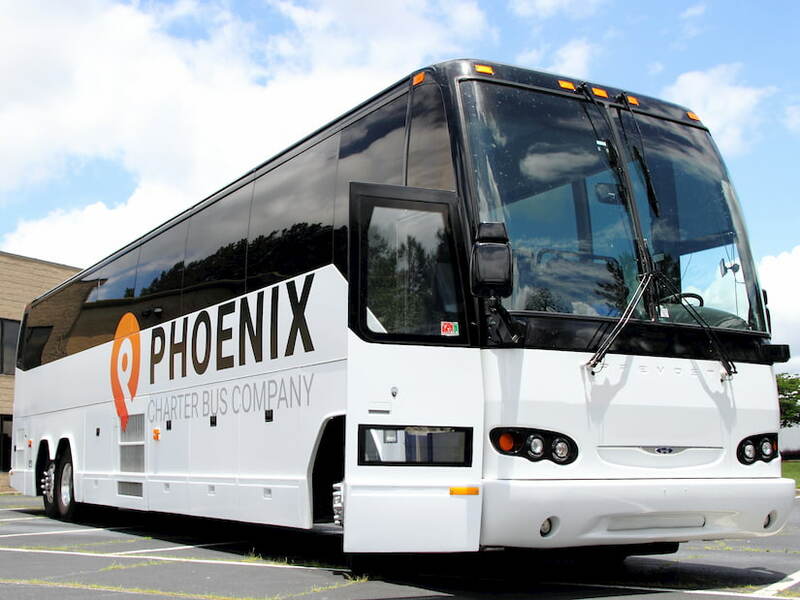 Phoenix Charter Bus Company brings you the best selection of bus rentals in the Phoenix area via our vast network of providers. Charter bus and minibus rentals in Phoenix as well as Scottsdale, Tempe, Glendale, and more are available to you with the help of our trusted providers and experienced reservation specialists who are dedicated to your satisfaction. You’ll have the choice of spacious motorcoaches, compact minibuses, and a variety of vehicle options in between to customize your transportation to your group’s needs. Not sure what’s best for you? Your reservation specialist will craft a fleet just for your group. When you call us toll-free at 480-445-9823, one of our team members will take into account your preferred itinerary, number of passengers, and bus preferences and calculate a personalized quote, free of charge. From there, you can secure your Phoenix charter bus and look forward to your upcoming trip. “Wow” your guests at your next Phoenix corporate event with a private shuttle service between the Phoenix Convention Center and your hotel. We know that staying on time is crucial to a successful event, which is why we only work with drivers who are dedicated to being punctual. Wedding days can be stressful. Luckily, with the help of Phoenix Charter Bus Company, shuttling guests is one less thing you need to worry about. We’ll be your designated driver between your hotel and your beautiful ceremony and reception at Boojum Tree, or to your venue of choice in the Phoenix area. Field trips to this unique Phoenix museum are a great way to engage your students, but traveling to the museum can be uncomfortable when you’re stuck with an outdated school bus. Allow us to find the perfect charter bus operated by an experienced driver who will put your students’ safety first, guaranteeing a safe and educational day out of the classroom. Whether you’re playing with coworkers, family members, or friends, we’ll provide your private group with a minibus to Troon North Golf Club in nearby Scottsdale or to your group’s favorite resort for a relaxing spa day. Leave the driving to us while you focus on unwinding! Supporting the Arizona Cardinals at Glendale’s State Farm Stadium is easy with a private charter bus! Load your tailgating gear onto your bus, and we’ll do the driving. Prefer a Coyotes or Diamondbacks game? Decide which Phoenix sporting event you’d like to see on your trip, and let us handle the parking and traveling logistics. A few hours north of Phoenix, this dazzling national park is a must-see for all visitors in the Southwest. Don’t feel like driving? Let a professional navigate your group with ease while you recline in your seat and enjoy the breathtaking scenery. Explore as long as you’d like— we’ll be there to pick you up and bring you home when your day is done. Before hitting the road, drivers must demonstrate that they’re prepared to take your group’s safety into their hands. We ensure that the drivers we work with have passed a series of background checks and training sessions, helping us to bring you the best in the business. With us, booking is fast and easy. All you have to do is call our 24-hour team at 480-445-9823 to learn more about our services, receive a free quote, and get ready to head out on your trip! We’re always happy to answer any questions you may have and help expedite your trip planning process. Contact us today to get started!